Now that we've covered the West Coast, let's move on to the cuisine further inland. The Midwest and Southwest offer many tasty traditional foods. When you're in these parts, make sure you taste some of these indigenous foods. Often referred to as "the breadbasket" of the United States, Midwest food is considered simple and hearty and exemplifies traditional "All-American" cuisine. 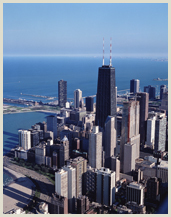 Food from the urban city of Chicago tends to dominate the food scene in Illinois. Chicago-style pizza, or deep dish pizza, is a far cry from its Italian pizza ancestors, with a thick perimeter of crust that can be a few inches tall; these tall sides often serve as a bowl to hold large amounts of cheese, sauce and toppings. This style of pizza was invented in Chicago in the 1940's. Chicago-style Hot Dogs- It is said that Chicago has more hot dog-selling establishments than McDonald's, Wendy's or Burger Kings combined. Chicago- style hot dogs have a myriad of toppings and are opposed to ketchup, which seems to be the topping of choice for the rest of the country. This style of hotdog is steamed or boiled, and served in a poppy-seed bun with mustard, tomato, kosher pickle spear, chopped white onion and celery salt. Chicago Italian Beef Sandwiches- Originating on the streets of Chicago in the 1930s, these sandwiches consist of thinly sliced, seasoned roast beef placed on an Italian-style hero roll that is then dipped in the juices from cooking the meat. These sandwiches are found everywhere in Chicago, but can be difficult to find outside of the Chi-town metropolitan area. Commonly found in Detroit, Michigan's choice is the chilidog, dubbed the Coney Island hot dog. Also in Detroit, there are many ethnic eateries that include high concentrations of Lebanese, Greek and Polish establishments. Minnesota and the food of this state, particularly in the Twin Cities (Minneapolis and St. Paul), is rich with cultural history. Two very distinctly unique Minnesota dishes are lutefisk and lefse; these were brought to the country by Scandinavian immigrants in the earlier years. Popular Minnesota foods also consist of something called hotdish (also prominent throughout the Midwest) which includes various casseroles full of hearty comfort foods. Typical Minnesota desserts are called bars, which are dense,rich desserts that are staples of this state. Common bars are lemon, chocolate-peanut butter, or Rice Krispies treats. The state of Indiana has Sugar Cream Pie considered a legacy of the Quaker settlers. It is a simple vanilla sugar cream dessert popular in this region. Indiana's other legendary local dish is persimmon pudding. Made like many European puddings, it is steamed or baked and often served with ice cream. The staple from Ohio is Cincinnati Chili. Due to a lack of chili peppers, this area spices its chili with strange ingredients like cinnamon, cloves and chocolate, and is often served over spaghetti or hot dogs with cheese. Did we miss your favorite regional food? Feel free to share your favorite foods that you've had while in the U.S. in the comments!